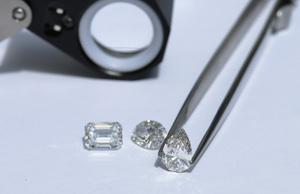 Ada Diamonds has partnered with Silicon Valley financier Affirm to offer you an easier, faster way of financing for your fine jewelry purchase over time with no hidden fees. Buy loose diamonds or finished jewelry with Affirm and pay off your purchase in easy, fixed payments over 3, 6, or 12 months at rates from 10-30% APR. For our customers with joint finances looking to surprise their partner with a gift of fine jewelry, Affirm may be a great option to maintain the element of surprise. For more information, inquire with a Diamond Concierge. Let your Diamond Concierge know that you want to pay with Affirm and they will send you an application. Your credit score is not affected by submitting an application. Pick a loan that fits your budget by splitting your purchase into 3, 6, or 12 monthly payments. Interest rates range from 10-30% APR, depending on your creditworthiness. Simply pay your monthly bill using a debit card or bank transfer at affirm.com/pay. There are no prepayment penalty or fees if you pay off the loan early. In many cases, customers are approved for Affirm loans without a down payment*, thus no credit card or bank charge will ruin a surprise. Surprise your significant other with brilliant diamond jewelry. Your first payment will be due 30 days after your gift ships*. Simply pay your monthly bill or pay off the loan at any time with no prepayment penalty or fees. Affirm is only available to United States residents. Shipping and billing addresses must be within the US. Know upfront exactly what you will owe, with no hidden costs, fees, or surprises. Learn more on the Affirm website, check out the Affirm FAQs, or get in touch with a Diamond Concierge. *Depending on your creditworthiness and the size of the loan, down payments are sometimes required. When you apply for the loan, a credit check is conducted and the results will determine if a down payment is required. The credit check will not affect your credit score.